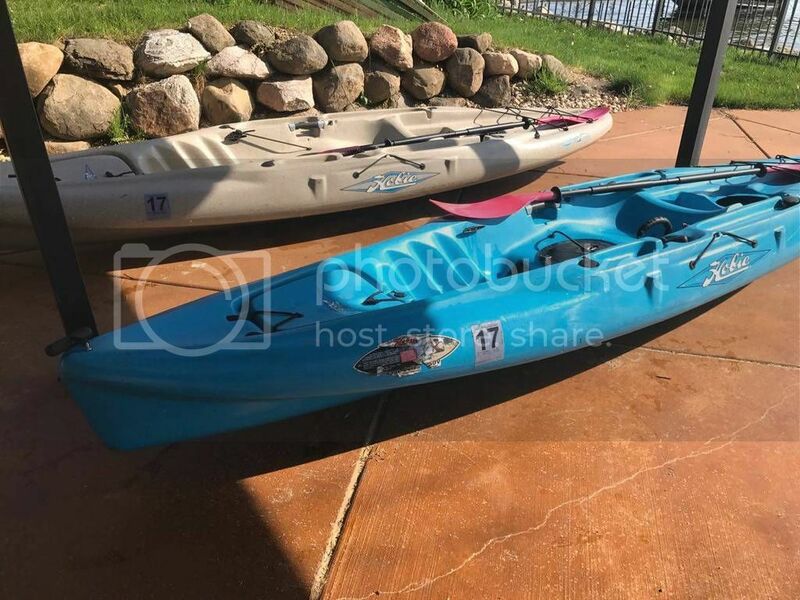 Looking to get my first Hobie and need some help. I got into kayak fishing with a 10' department store kayak (Future Beach Discovery) and love everything about it except my kayak. So my main complaints about current kayak is unstable to the point where my storage is almost useless for anything not in arms reach is a seated position. Seating is uncomfortable for long trips but not unbearable. No ability to effectively troll or cover a lot of water being that it's not pedal drive. Thing I like about my kayak. Its light and easy to manage by myself. So my budget is $3k for a kayak and I've got some options I will go through below. My new kayak must be stable enough to get up and access the storage & have the mirage drive. Nice to have would be a vantage type seat, MD180 drive & $600 left over for a fish finder with down/side imaging. Buy a new Compass. I worry about a buying a brand new model kayak. I've heard good things about the compass and Hobie customer service but still makes me a little nervous. So this option leaves me $950 to either buy the MD180 or a fish finder not both. If I was to buy a MD180 what could I realistically get for the standard drive with everyone wanting a MD180? Used drive sell on Ebay for $300 so I'm thinking $400-500. Buy a used 2006 outback for $1400. 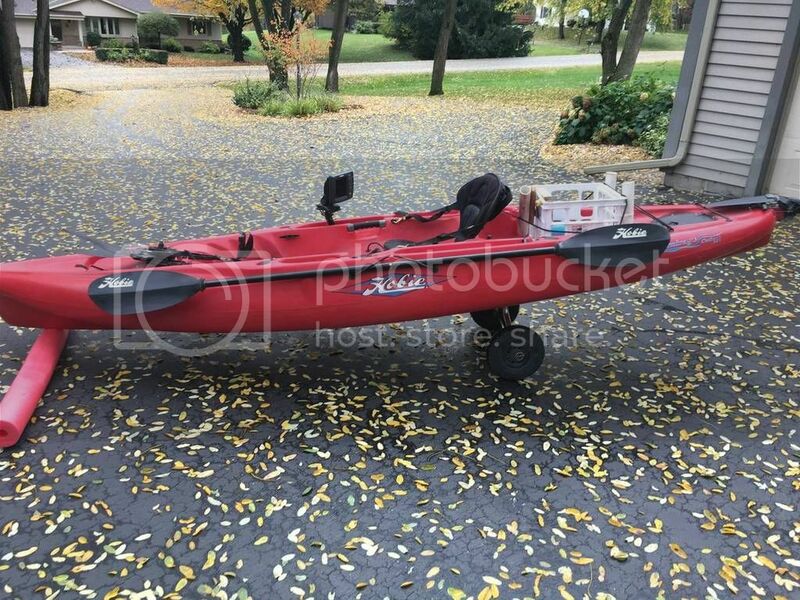 Includes: Humminbird Side Image/Down Image/fish finder gps combo, Lake Master sd card for my area, Hobie Paddle, Mirage Foot pedal drive, hobie seat, dolly, storage crate with 3 rod holders + 4 built in rod holders, battery. So I get the nice fish finder with and a scupper cart which would be nice. I heard this year could possibly be prone to cracking can anyone confirm this? So I would not get the Vantage seat or MD180 but would have $1500 to bank for either and MD180 or new Kayak next year. Buy a used Outback without drive (unknown year) for $600 (either one below) & add MD180 for a total of $1400. Seem as this one is missing the padded seat as well. Again no vantage seat and possible cracking issue. I have sent an email to find out the year useless someone can tell by the pic. This option I could bank the $1500 and possibly buy and new or used compass next year and have the MD180 already. Then I could swap the drives and sell the outback (for maybe 1000?). Or possible buy the Outback simply to make the drive easier to sell as a package with a kayak and buy the compass. I'm kind leaning option 1 or 4. Any help would be greatly appreciated! If it were me, I would "demo both the compass and outback" so you can make a real side by side comparison. I would also skip option 4 if you are really into fishing as the 2006 model did have cracking issues, uncomfortable seat and it does not have the click and go mirage drive feature. If you decide on the compass, skip the 180 and get turbo fins......the kayak will really scoot on the water.......but if you are trolling, at least in my type of fishing, 1.5 to 2.0 MPG is the correct speed. You don't need a speedy kayak to accomplish this. You will also have $$ to invest in a new fish finder/gps combo. In these parts (wisconsin) I will have to wait till spring to give it a test but might be worth waiting. I have never been in a Hobie anything. I'm just living vicariously through youtubers. Thinking I may be able to snag a deal in the off season. Then I could set everything up in the off season for spring fishing. This whole new pedal kayak business started when I hooked into a something big and it towed me all over the lake as I frantically one handed paddled toward the shore before I lost it. I guess I feel like I need reverse but in that circumstance any control would have helped. So one year and I already have "the one that got away story" covered. I know the guy at the Hobie shop says you can put the drive in backwards for reverse anyways. My thinking right now is I want a compass . Outback consideration is for proven design, MD180 and seat adjustability. A test drive might make the decision easier. really old models could have you pouring money into drive servicing and upgrades, only to have the hull then fail on you. hobies are not cheap so skimping on them can see you making an expensive mistake. I'm sold that the Outback is the do all Hobie kayak. It fishes well and can be used for lot of other activities. Get a new Outback, new seat and new 180 drive if you fish. Thanx for the input Gents. What I was looking for. I will be impatiently waiting for spring to arrive and give the 2 a test drive. Option 5: Buy used 2015+ OB. Not knowing what type of fishing you do, I will tell what I do and it might give you an answer. I am a 72 y/o '17 Outback owner and river fish mostly but often go to panhandle of Florida and hit the bayous and bays. I have no trouble standing in my OB. I haven't been out in the gulf as yet but feel confident that the OB will handle a calm open water day. When I'm in the river, weekly, I enjoy entering sloughs, narrow creeks and treetops the reverse is awesome. In the bays the reverse is great for pulling a big redfish away from the marsh without a hassle. You mentioned liking the ease of loading your light kayak. I have a short bed pickup and purchased a hitch extender and I load and unload it by myself in minutes. If you troll in open lake or gulf water, get a OB '16,reverse not needed. If you like to get among the fallen trees, get an OB '17 or '18. Hope this helps. Keep in mind the way you plan on transporting your yak. If you are going rooftop, weight will be an issue. I have a 13' REVO and it's a job getting it up and off my SUV, but I manage. An Outback is pretty heavy. agoodhi - Yup! if i can find one. Up here atleast the only late model hobies availibles are 14' PA's. Im sure id love one except for puting it in and out of lakes. I like going directly after work with a 40+ min drive to a lake i prefer to pull up to my garage and just toss the yak in and go. I have really no room for a trailer. Yakrazy45 - Mostly lakes small, medium, large, deep and shallow. We have them all in Wisconsin. I traverse rivers mainly to get to lakes without boat launches. Big water for me is lake michigan on calm days. I do like to get into fallen trees. I feel like i want reverse but could live without it. I also have a short bed truck. I will be going from a 10' to a 12' so a bed extender was an idea I had. JohnsYak - No Roof tops for me. Thanx gents. My thinking is still wait for spring and test drive an outback and compass pick the one i like. If i choose the compass and have to have reverse I will find the $850. I will keep my eyes peeled for a late model outback and might pull the trigger is a deal can be had. Up here is seems like they dont want to sell them or everyone is buying PA's. Go with the Outback for sure. The 180 drive proves to be very helpful. I use it on every trip. I especially like the reverse drive in the wind. I can hold in place off a windy bank / point and continue to fish hands free. The Outback handles the rough water well. I have one Outback and will soon be purchasing a second!